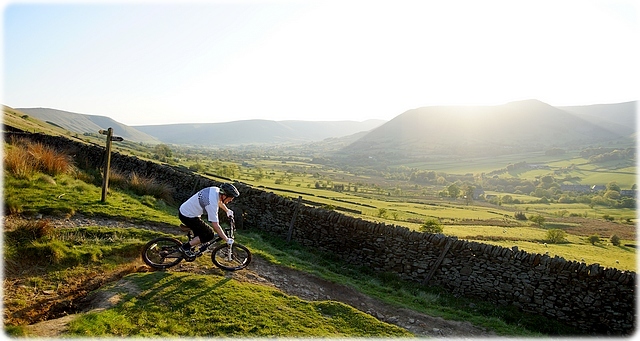 The Peak District is one of the most popular areas for Mountain Biking in the UK. Mountain bikers have been coming to the Peak for a long time for its unique and challenging trails. It offers stunning scenery and wilderness feeling, whilst being well developed and easy to access at the heart of England. Where can mountain bikes be ridden in the Peak District? What to do when encountering horse-riders? What’s the difference between MTBing in the Peak District and a trail centre? What to take on a ride in the Peak District? What to do if something goes wrong when riding in the Peak District? Places to mountain bike in the Peak District consist almost entirely of the Public Rights of Way network, which are ancient paths people have used for centuries to travel, but are now mainly used for leisure and recreation. Sources: Natural England: Waymarking public rights of way, Ordnance Survey: Everything you need to know about Rights of Way. 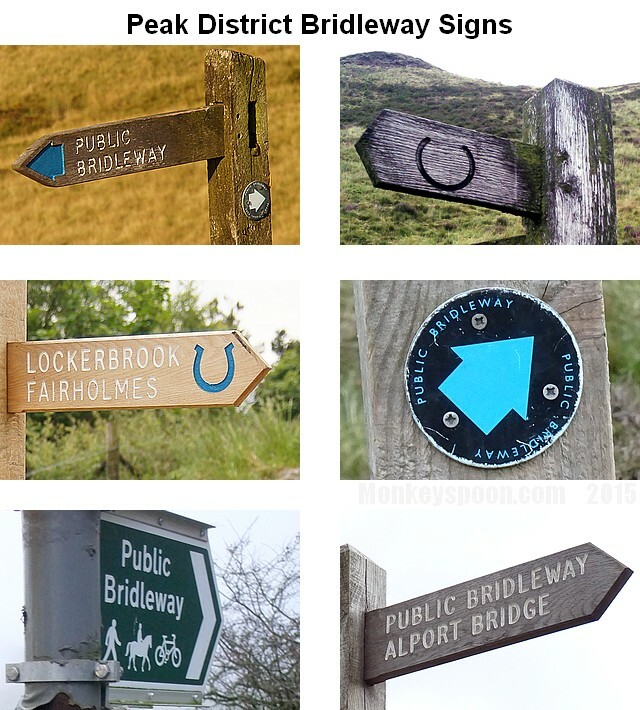 In reality use of the ‘official’ way-marking symbols varies on the ground, as the examples of Peak District bridleways signs below demonstrate. Respect the other people using the countryside and the local community. When multiple user groups share the public rights of way network, they need to be considerate to each other. Slow down and give way to others users where necessary – as common sense dictates. Always control your speed and be prepared to stop suddenly when passing others, they might not act as you anticipate; especially dogs and children. Whilst those going on rights of way where bikes have access should expect to meet MTBers, this is often not the case and people and their animals can be startled if you approach fast from behind. When approaching others from behind having a bell to ring may help, but normally a friendly call of “Hello”, “Excuse me” or “Bike” from reasonable distance away alerts people to you presence without too much of a shock. When approaching a blind corner or brow of a hill you should expect to encounter walkers, other mountain bikers, horse riders, or livestock (sheep, cows, horses) and adjust your speed accordingly. Being polite and courteous to other users can only benefit the mountain bike access cause in the long run. Unfortunately sometimes it only takes a few idiots on bikes mistreating other users for all mountain bikers to get tarred with the same brush. Make your presence known clearly and early. A simple shout of “bike” will suffice, but don’t wait until you are close to the horse. Try and keep a distance of 2m between bike and horse where possible. When there are multiple MTBers, you should all move to the same side of the trail. If the horse is startled it has nowhere to go if MTBers are on both sides of the trail. If approaching a blind corner or brow of a hill you should expect to encounter horse riders and adjust your speed accordingly. There’s more information on this in the British Horse Society’s leaflet: Code of conduct for horse riders and cyclists. Natural trails – Most of the trails in the Peak are ancient paths that have been naturally shaped over many years by the elements and use by people and animals. Those that have been surfaced pre-date MTB use, so may have challenging sections or vary in width and have a number of possible (or not) riding lines. For many, this is one of the great attractions of riding in the Peak District. Scenery – Many trail centres are, by necessity, in large pine forests with limited views. By contrast, the Peak District offers many superb views and varied scenery for mountain bikers to take in as they ride. 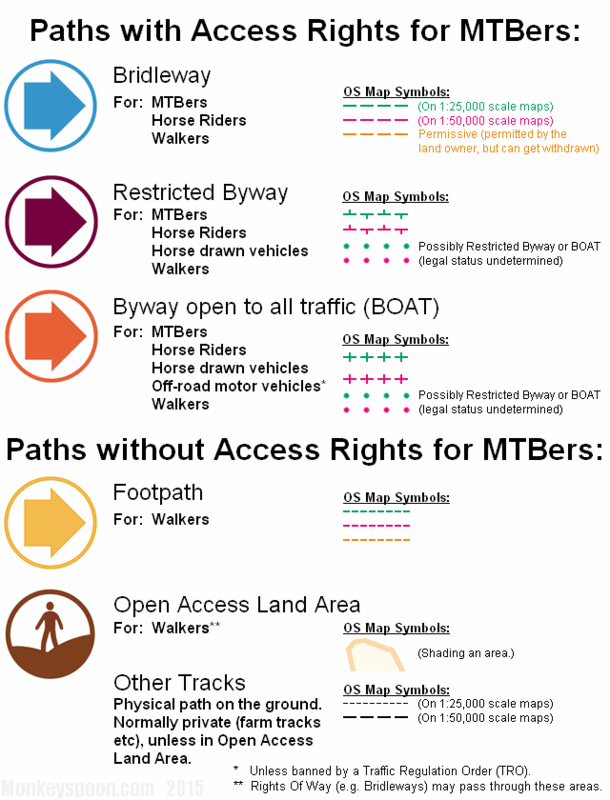 Shared trails – All paths in Peak have access rights for walkers and paths with access rights for MTBers also have access rights for horse riders and sometimes off-road motor vehicles. No trail grading – Since the Peak trails have not been built to any standard for biking, they vary in difficultly and even a generally easier route may have some very difficult sections. It is not unusual to see riders who are new to the terrain walking their bike through some difficult sections on a ride. No marked routes – Routes are not marked or signed as MTB loops. A map, guidebook or knowledgeable companion is a good idea. Most junctions and paths have signs showing the type of right of way and some have place names, but they aren’t always useful or don’t appear on the map. Distance back to the car – Most trail centres cram a lot of length of trail into a relatively small space, so you’re never normally that far from the car if something goes wrong (a mechanical problem or injury), and they normally have forestry access roads that can be used as a shortcut. This is not the case with most Peak District routes, which could mean 10 miles of pushing your bike. When choosing or planning your route it’s useful to think about possible shortcuts to reduce the length of the ride if you get tired or have a problem. Some paths go a long way from civilisation, depending on the location and time, it could be a long time before anyone passes by (let alone with the right bike tool). On rare occasions getting lost and bad weather have resulted in death. It is important to consider and take responsibility for your safety. Exposed heights and weather – A lot of Peak District routes go over high ground, which can be much colder and windier than in the valleys, especially in winter. The weather can change quickly. Snow and ice can stay on some sections long after it has gone from the lower ground. Most paths are not surfaced to be weather resistant and drain quickly, unlike trail centres, and can be boggy or prone to heavy erosion in winter or after lots of rain. It’s strongly recommend you carry a decent map when you’re out riding in the Peak District. (GPSes and phones are great – til they run out of battery or lose signal.) The Ordnance Survey Explorer maps have great detail and clearly show rights of way and elevation. There are two Explorer maps covering the Peak District; Dark Peak area (OL1), including the Hope Valley and north, and White Peak (OL24) area, covering south of the Hope Valley. If you’re new to map reading, see Ordnance Survey: Map reading. See the Monkeyspoon.com OS Tracks Map for route planning and info on the tracks in the Dark Peak. Monkeyspoon.com: Tracks – Information and pictures of descents, mainly in the Dark Peak. Mountain Bike Rides: Routes – A number of routes in the Dark Peak and White Peak and in 2 formats for GPS navigators. Bike Garage: Routes – A taste of the routes starting from this bike shop in the Hope Valley. Keeper of the Peak (@KoftheP) – The famous trail status Twitter feed, for up to date info on conditions and trails to avoid. Pedal North: Routes – A number of routes in the Dark Peak and in GPX format for GPS navigators. Peak District Mountain Biking: Dark Peak Trails – The popular guide book with routes from Vertebrate Publishing. White Peak Mountain Biking – A guide book with routes from Vertebrate Publishing. There are two bike shops in the Hope Valley; Bike Garage in Bamford, which also offers mountain bike hire, and 18 Bikes in Hope. Derwent Cycle Hire offers basic mountain bike hire from the Fairholmes visitor centre in the Upper Derwent Valley, and is good for beginners and families wanting to progress to something more adventurous than the Monsal Trail. Many more bike shops can be found in the cities and towns bordering the Peak District. For more information about the area and visiting see VisitPeakDistrict.com. A mountain bike; well maintained, with good brakes (disc brakes are better) and at least 80mm of front suspension is recommended. More water and food than you expect to need. If riding in a group then some of the items can be shared. Also remember that even if you never need all these items, you might come across someone less prepared who does. Punctures can be common, but should be easy to resolve, if not it’s pushing time (you might be able roll some smooth descents, but rocks could damage the wheel rim). The chain snapping or the dérailleur (rear mech) being snapped off by a rock can happen, the solution is to shorten the chain (if you have the tool) and still be able to pedal with 1 gear or to cable tie the chain or mech out the way of the wheel so you can still roll on the bike. Brakes can fail, but since there are two and they’re independent, you can still ride, but must take it easy on descents. Don’t panic, assess the situation with a clear mind. Can you make it back to your car on foot or to somewhere a friend can pick you up? Do you have mobile signal or can you get to somewhere that does have it? If it is a real emergency and you can safely get to a road you can call an ambulance (provided you have mobile signal). If it is a real emergency and you can’t safely get to a road, you will need to call for the Mountain Rescue Team (who are volunteers). In both cases it’s important to know where you are so they can find you. Don’t panic. Use your map and reassess where you might be or where you might have gone wrong. Look at your surroundings and for landmarks that appear on the map. Look for junctions with signposts. Passers by can help and will probably know where you are. Only call Mountain Rescue as a last resort in severe weather or if it looks like you will face a night on the hills.